I just read another excellent article at automotorundsport.de and once again their analysis is spot on. Here is the summarized and translated version of the story how Toyota panicked before Le Mans 2013. When Toyota entered the Le Mans scene in 2012 nobody expected them to be right on Audi’s tail. The first races until Le Mans were to be seen as preparation, but in France they dropped the hammer. The TSO30 was a bit faster in the race than the R18s, but fuel consumption was Audis advantage. Sadly we never saw the end of the battle as both Toyotas crashed and left Audi to have an internal battle. 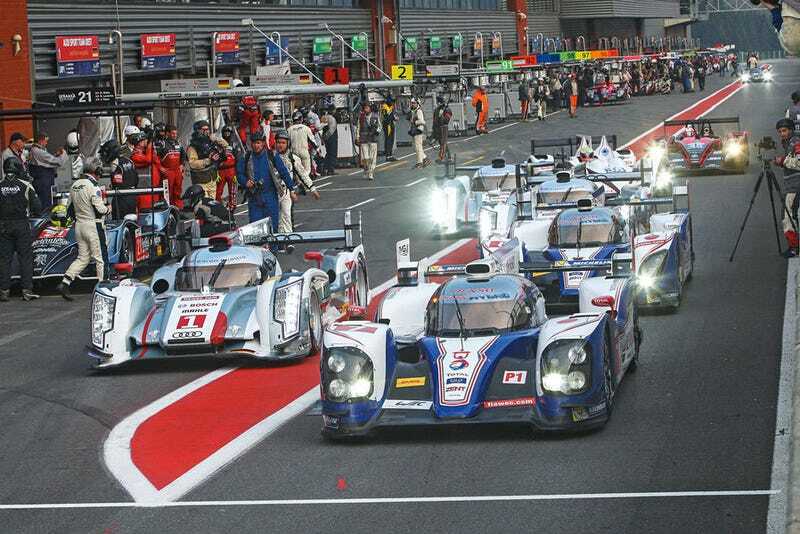 For the rest of the WEC season the cards were open and Toyota showed their true pace with 3 wins in 5 races. It would have been 4 but the positioning lights, a part provided by the ACO, broke in Bahrain and forced the leading Toyota to a repair stop. Audi was shocked due to the great Toyota performance. More downforce, a better Hybrid system, better tire management. It was clear that “ze Germans” had to rework the R18 to keep up. Fast forward to Spa 2013, 2nd WEC race. It was the first time the 2013 spec Toyota would race, and Audi brought a Le Mans spec “longtail” R18. This was the first taste of the upcoming battle. Qualifying was a mess for Toyota, they lost heavily. During the race the 2013 TSO30 could keep up the pace more or less, but something in the drivetrain broke and the car was retired. One could think it was alright, same pace but an unfortunate failure for the Japanese. 4 days later it became clear it wasn’t. After analyzing the data they gained it became clear that Audi had raced with more downforce and therefore more drag in Spa but still was faster in terms of acceleration and top speed. Toyota asked the ACO to reconsider the balance of performance as they claimed to have a disadvantage of around 40hp. Doesn’t sound like that much, but over a single Le Mans lap 10hp make a difference of 0.8 seconds, so Audi has an advantage on the engine alone worth 3.2 seconds. And they developed a blown diffusor, similar to F1, which seems to be the better solution than Toyotas all new chassis. In the end TMG received 3 more liters of fuel capacity and a slightly bigger air restrictor, but will it be enough? Audi is leading in pure engine power and aero efficiency while Toyota is in front in tire management, hybrid system and fuel capacity. It could be that Audi will have a pure speed race tactic and that Toyota will try to win Le Mans on pitstops. The last time this scenario occurred was 2011 and it made for an epic finish between Peugeot and a R18 which the Audi won by 13.8 seconds. Close enough for me over a 24hour sprint.